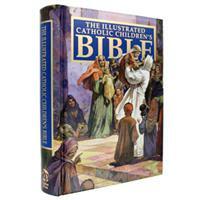 Hardcover children's Bible with full color illustrations throughout its 432 pages. 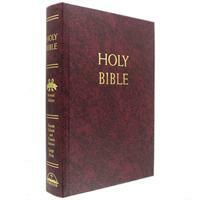 The Bible Stories are based on the NAB version of the Holy Bible. A perfect gift for a special child or a great resource for family story time. 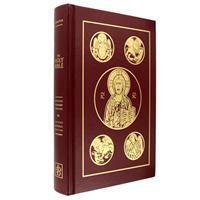 Hardcover Bible - beautifully illustrated in full color. 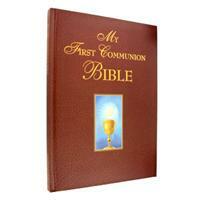 One of our best selling Children's Bible for a First Communion gift and for Christmas or a Birthday as we share the Bible stories from our faith with the children in our lives. 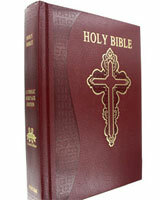 A family Bible 8 3/4" x 11 3/4" with burgundy imitation leather, padded cover. A full color family record page and special inserts for the readings on the day of the wedding. A lovely Bible to use for a lifetime. 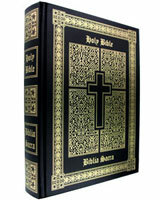 Douay-Rheims and Latin side by side in the beautiful hardcover leather Bible with intricate embossed cover, gilded edges and two satin ribbons. 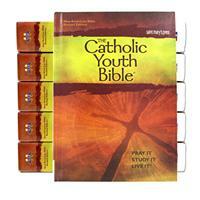 Catholic Youth Bible, Hardcover NABRE with quantity pricing. Perfect for your youth group, class or confirmation gifts. Articles help youth use the Bible for prayer, understand and study the scripture and apply the truths found in the Bible to daily life. 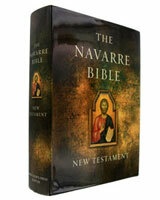 Hardcover, expanded edition of New Testament, RSV Translation of Navarre Bible. It draws on writings of the Fathers, the Magisterium of the Church & works of spiritual writers, including St. Josemaria Escriva. Two colors throughout with English & Latin. Bulk Discount for this Good News Translation aimed at reaching young people from 10-14 with colorful artwork, engaging stories about the people of the Bible and relating our faith story. Hugely popular, contemporary Bible that reaches out to preteens. 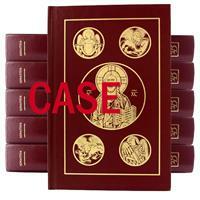 Case Priced Revised Standard Version, Hardcover Revised Standard Version of the Catholic Bible with a durable hardcover that is embossed with icons on the front. Slightly heavier paper helps readability, full color maps and reference footnotes included. 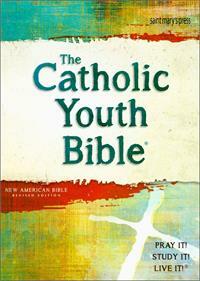 Catholic Youth Bible Revised Hardcover NABRE. Articles to help youth use the Bible for prayer, understand and study the scripture and apply the truths found in the Bible to daily life. Just for teens, perfect for graduation, confirmation, and birthdays. 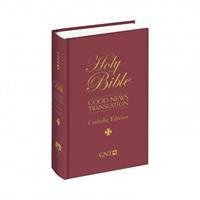 Revised Standard Version of the Catholic Bible with a durable hardcover that is embossed with icons on the front. Slightly heavier paper helps readability, full color maps and reference footnotes included. Good News Translation aimed at reaching young people from 10-14 with colorful artwork, engaging stories about the people of the Bible and relating our faith story. 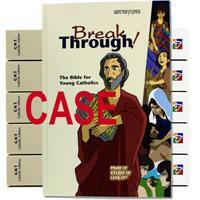 Hugely popular, contemporary Bible that reaches out to those entering adolescence. 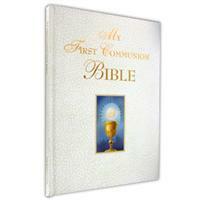 Catholic textbook Bible with a hardcover and full features. Often used by schools, retreat centers and youth groups for the durable cover. It has page indexing for ease of study, maps, the cycle of readings and a dictionary. 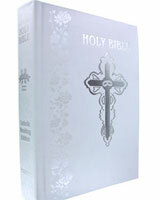 A family Bible 8 3/4" x 11 3/4" with white leather, padded cover. A full color family record page and special inserts for the readings on the day of the wedding. A lovely Bible to use for a lifetime. 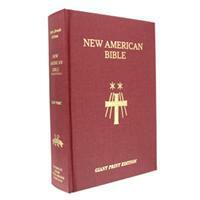 The Giant Type Edition of the St. Joseph New American Bible Largest type of any Catholic Bible in a comparable size. 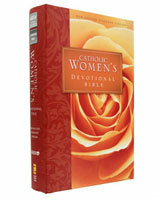 Includes the complete Old and New Testaments in giant, easy-to-read 13-pt. type, notes at the end of each book & footnotes. 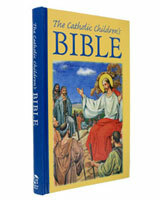 Our most popular children's Bible! Perfect for a baptism gift or anytime. Little ones love the child sized, yellow handle for carrying to church and the cheerful illustrations that tell the Bible stories are bright and engaging. Highly recommended! 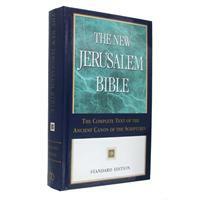 New Jerusalem Catholic Bible in a readers edition that contains the unabridged biblical text. Offering concise introductions to each book in the scripture and complete notes. An easy to read two column format and contains a glossary. Stunning representation of the St. John's Bible: Gospel and Acts, which has been lovingly illuminated in whole by St John's Abbey. This book is a wonderful glimpse into that Bible and inspires us as we read the scripture. Stunning representation of the St. John's Bible:Psalms, which has been lovingly illuminated in whole by St John's Abbey. This book is a wonderful glimpse into that Bible and inspires us as we read the scripture. "The Golden Children's Bible" is beautifully illustrated in full color and written in a simple yet poetic style. 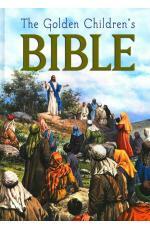 Covering both the Old and New Testaments, it retells all of the major Biblical stories. A remembered favorite and a perfect gift.